STEP 1– Plant a new lawn during the best seed germinating time of the year, which is generally August 15 thru September 15 for much of Oregon, and Mid-April through Mid-June as a second choice. STEP 2– Check for low spots and any drainage problems. Remove all debris, wood, stones, etc. Level the ground if needed. Pull or spray hardy weeds with an organic non-selective herbicide. STEP 3– Till and rough up the existing soil. Add any necessary amendments after testing your soil, including lime, topsoil, compost, http://maientertainmentlaw.com/?search=accutane-injury-lawyer-columbus Biochar, etc. STEP 4– When the soil is moderately dry, rototill and rake until level, leaving small clods from grape to golf ball size. A “pebbly” surface is best. STEP 5– Apply a fertilizer high in nitrogen and phosphorus like source site Bio-Turf. It’s specially formulated for lawn health and good root development. http://cinziamazzamakeup.com/?x=comprare-viagra-online-generico-a-Milano Bio-Live is also great used alone, or mixed with our other fertilizers. It adds beneficial bacteria and mycorrhizal fungi to the soil. Water in thoroughly. STEP 6– When dry, rake the seedbed level to create a gradual slope away from buildings to prevent any drainage problems. STEP 7– Apply the seed per instructions on commercial spreader. Rake in lightly, covering to a depth of 1/4”, or cover the seed with a very thin layer of hydrated coconut coir fiber to keep moist. STEP 8– Lightly roll the entire surface to firm up the seedbed, then water lightly to 1/4” depth. STEP 9– Thereafter, water frequently, but lightly so the surface remains damp. After 2 weeks, re-seed any bare spots and wash-outs. STEP 10– When seedlings reach a height of 2-3”, mow to recommended height with a sharp mower when the grass is dry. It is optimal to have 6-8 weeks of good growing weather after seeding. Grass seeds germinate best when the air temperature is between 60º and 85ºF. In the Northwest, mid-August to mid-September presents a near perfect environment. Also, in many parts of Oregon, a good time to plant is from mid-April to mid-June. If you need to bring in additional soil, lightly rototill your existing soil first. Then, spread the new soil and work it in. You will want to rototill in order to loosen the first 6-8” of soil, as well as allow the soil to be graded. A pebble-like texture is ideal. If it is tilled too fine like powder, it can damage the soil structure and reduce infiltration. It is best to till the soil when it is relatively dry, but not dusty and crumbly. After tilling the area once or twice, add your topsoil, compost, lime, and/or other soil amendments if needed. A soil test for pH and nutrient deficiencies can help determine what you might need to use. Consider also using click Biochar as an amendment to help refresh soil by enhancing aeration, nutrient and water availability, and improved soil texture. Spread the amendments uniformly over the entire surface and till again to achieve an even mixture. Grading is also an important step to help level out your area. You want to scratch down any high spots and fill in low spots. Using a larger lightweight grading rake (which can be rented), rather than a small garden rake, can make the job much easier. Creating a level gradual slope away from buildings and flush to the concrete can help prevent drainage problems. The objective is to spread seed over the area so that your grass will germinate and grow uniformly. If you do not have access to a calibrated seed spreader, then divide your grass seed in half. Spread the first half of your seed over the entire surface of the lawn while walking back and forth. Next, spread the second half of your seed while walking back and forth perpendicularly to our first orientation. For amount of coverage, refer to the requirements for the variety of grass seed you choose. Apply fertilizer just before, or after seeding. For establishing your lawn you can use fertilizer relatively high in nitrogen and phosphorus, such as http://maientertainmentlaw.com/?search=generic-viagra-online Down to Earth’s Bio-Turf 8-3-5 which has extra potassium for reducing seasonal stresses related to temperature and watering changes. A typical home lawn gets more complex each year. In the first year it contains mostly grass species found in the seed mix, but over time it evolves to 3 or 4 species that have adapted to Western Oregon’s climate. This new mix is referred to as a “climax lawn” and is a natural process as your lawn adapts to its environment. By concentrating on mowing, irrigating, fertilizing, dethatching, and aeration, you can maintain a healthy and attractive lawn. If you choose to do only one maintenance task, you should mow, but mow often. Weekly mowing from spring through fall will produce good quality turf. Turf quality drops dramatically when the height is maintained over 2 inches. Bentgrasses or annual bluegrass prefer a shorter mowing, down to 1/2 to 1 inch. Perennial rye grass, fescues, and Kentucky Bluegrass optimum height is from 1 1/2 to 2 inches. An occasional mowing during winter might be necessary to keep the turf in good shape before the spring growth spurt. From June through August, lawns need to be watered deeply once a week in order to apply the right amount of water. If a dense, vigorous lawn is not your priority, watering deeply every two weeks is sufficient. Instead of following a predetermined watering schedule, it is better to observe your turf and check the soil moisture regularly. If it is dark green and doesn’t spring back after stepping, it needs watering. Check the moisture by inserting a 6” screwdriver into the turf. If it takes some effort to push it in, it’s time to water. If it penetrates easily, hold off on watering. 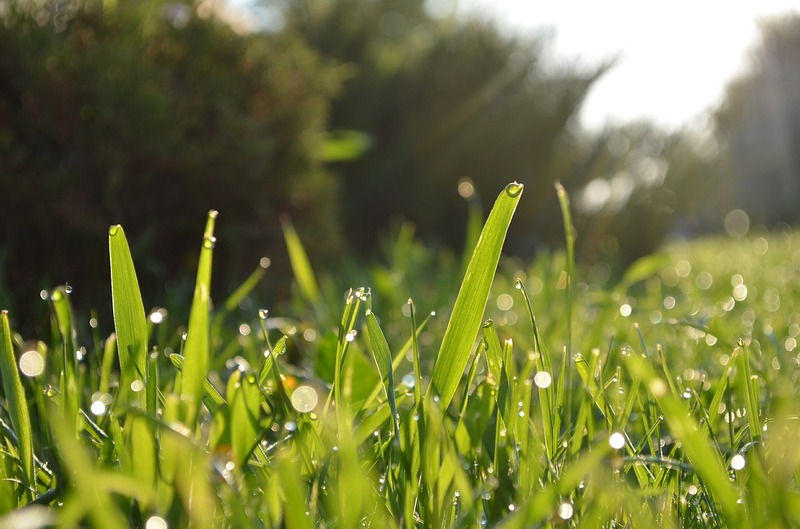 Typically, lawns in the Willamette Valley need 3-5 inches of water in July and August, 2-4 inches in June and September, and even less in May and October. If you have clay soil, water more frequently with shorter irrigations to avoid runoff. You should fertilize at least twice a year in order to maintain a relatively healthy lawn. If you only fertilize twice, fertilize in April/May, and again in September. If you will fertilize more than twice, do so in April/May, July, and October. Depending on soil test values, you might use our balanced Bio-Turf 8-3-5 to add additional phosphorus and potassium. Turf problems are often the result of excess thatch. Thatch is a tightly intermingled layer of grass stems and roots, both living and dead that form between the soil surface and the green foliage- a result of inadequate watering and lack of organic material. The main problem with thatch is that the grass roots only grow into it, rather than into the soil. Dethatching can be done with a vertical mower (also called a verticutter or dethatcher) or you can use a steel rake to rip up the thatch. The optimum time to dethatch is when the turf is starting vigorous Spring growth, usually around Mid-April. Turf dethatched in the Spring recovers faster, and is less prone to weed encroachment than when dethached at other times of the year. As much as 75% of the moss can be removed by dethatching. Cryptocidal (moss-killing) soaps such as Safer brand Moss & Algae Killer are also available and are safe to use on sidewalks, roofs, and other structures. Always follow manufacturer’s instructions for application of these products. Using Lime in the soil can reduce acidity and help to discourage the growth of moss. Moss growth typically starts with fall rains and reaches a peak in early spring. Moss is generally associated with thin turf, low fertility, high acidity, shade, and wetness, and it is impossible to control until these problems are corrected. The use of beneficial nematodes can be a detriment to the larvae of harmful insects such as crane fly, fungus gnat, flea & tick larvae, and many more soil dwelling insects, without harming earthworms.